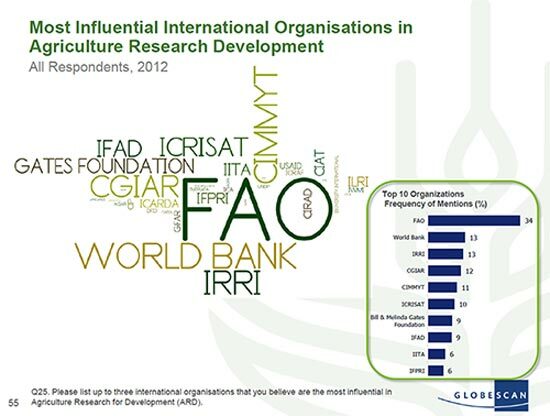 Findings provide the CGIAR with a good opportunity to improve perceptions across the dimensions related to building and sustaining relationships – Collaboration, Capacity Building, Accessibility and Transparency. *GlobeScan is a company specializing in research-informed counsel for multinational and regional companies, industry associations, multilateral organizations and NGOs. Overall satisfaction of MAIZE CRP partnership is high, with 84 percent of respondents saying they are satisfied with their partnership. MAIZE came in overall third position after GRiSP and WHEAT and came either 1st or 2nd place for 12 partnership criteria (out of the 26 criteria used in the survey). Research outcomes and expertise are the two indicators in which MAIZE performs strongest, with global expertise and sector-specific knowledge being the top two performing dimensions. Collaboration is seen as the area in which this CRP needs to improve most, though even here 62 percent of respondents give it a positive score. Only on fair distribution of funding (48 percent) and making information available (49 percent) do less than half of respondents give this CRP a top three box rating. When compared to CGIAR as a whole, collaboration and accessibility are rated significantly higher (16 and 15 points, respectively).